The UbiGate Components (set1) contains plasmids that allow generation of polycistronic expression cassettes for coexpression in bacteria of up to six ORFs simultaneously (contains ubiquitin, the E1 UBA1, a complete collection of E2s, a selection of E3s and their cognate substrates, to reconstitute ubiquitination assays). The UbiGate E2 activity screen (set2) contains constructs for E3 autoubiquitination assay (includes expression cassettes containing ubiquitin, the E1 UBA1 in combination with all Arabidopsis thaliana E2's). Both kits are shipped as bacterial glycerol stocks in a 96-well plate format. This set allows generation of polycistronic expression cassettes for coexpression in bacteria of up to six ORFs simultaneously. In addition, the kit contains ubiquitin, the E1 UBA1, a complete collection of E2s, a selection of E3s and their cognate substrates, to reconstitute the ubiquitination assay. Genes of interest can be cloned in the standard Level 0 cloning vectors pUG-41308 to generate tag-less and N-terminally tagged versions, as well as in pUG-1287 for C-terminal tagging. All vectors contain standardized genetic modules that can be used for hierarchical assembly based on the Golden Gate cloning technique. Six control constructs to test in bacteria ubiquitination, purification, and detection procedures are also included (please see information on control plasmids at bottom of page). 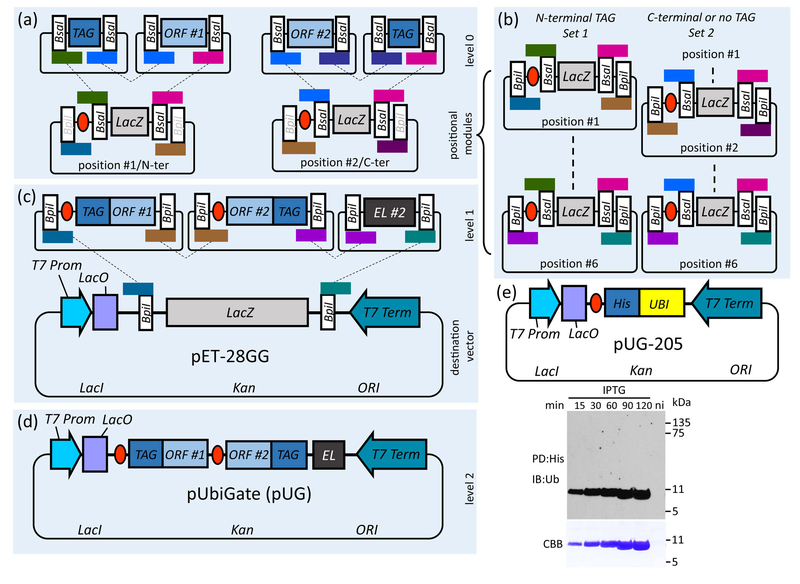 Figure Set1: UbiGate assembly of polycistronic operons for ubiquitination analysis. (a) Open reading frames (ORFs) amplified by PCR with flanking BpiI recognition sites are cloned by restriction-ligation into level 0 vectors (only the resulting level 0 constructs containing an insert are shown). Level 0 vectors containing an ORF, and optionally a tag, are cloned into level 1 positional vectors using BsaI. The four nucleotide unique cleavage overhangs (UCOs) resulting from type IIS restriction are depicted as coloured boxes over BpiI or BsaI recognition sites. Note that UCOs are generated in distinct orientations in dependence of recognition site orientation. (b) Two sets of six level 1 positional vectors allow cloning of ORFs with N- and C-terminal tags for six defined positions. (c) The destination vector pET-28 Golden-Gate (pET-28GG) was created based on the pET-28b vector containing a LacZ flanked by BpiI sites for blue/white selection. (d) Level 1 vectors are assembled into the pET-28GG by BpiI restriction-ligation, resulting in the desired level 2 polycistronic operon. (e) Inducibility of the new pET-28GG vector containing His–Ub (pUG-205) was tested by applying 0.5mM IPTG and analysing accumulation at the indicated time points. His–Ub was purified by immobilized metal ion chromatography (IMAC) and resolved by SDS-PAGE using 12% tricine gels and analysed by immunoblot (IB) using anti-Ub and coomassie brilliant blue (CBB). This collection includes expression cassettes containing ubiquitin, the E1 UBA1 in combination with all Arabidopsis thaliana E2s (ubiquitin-conjugating enzymes). Constructs can be employed to assay the auto-ubiquitination activity of an E3 ubiquitin ligase of interest in the presence of different E2s, by coexpression in bacteria. Six control constructs to test in bacteria ubiquitination, purification, and detection procedures are also included (please see information on control plasmids at bottom of page). Figure Set2: E3 autoubiquitination assay by co-transformation with UbiGate constructs. (a) GST-AvrPtoB in pGEX-4T-1 and an operon containing His-ubiquitin, UBA1, HA-UBC8 in pET-28GG were co-transformed in BL21(DE) cells. Protein expression was induced with 0.5mM IPTG and cells were harvested after 3h. 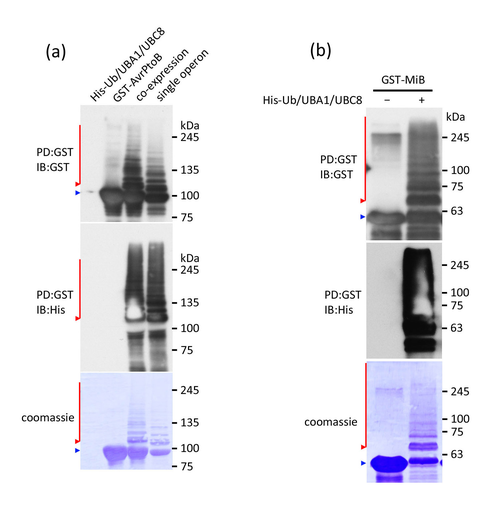 Proteins were purified with glutathione sepharose, eluted with 15 mM reduced glutathione (GSH) and resolved in a 7% PAGE (glycine) and analysed by IB using the indicated anti-bodies. Blue triangles indicate the unmodified E3, red triangles and lines E3-Ub(n) conjugates. (b) GST-Mib (aa 738-1030) from zebrafish (Danio rerio) in pGEX-1T and an operon containing His-ubiquitin, UBA1, HA-UBC8 in pET-28GG were co-transformed in BL21(DE) cells. Protein expression was induced with 0.5mM IPTG and cells were harvested after 3h. Proteins were purified with glutathione sepharose, eluted with 15 mM reduced glutathione (GSH) and resolved in a 7% PAGE (glycine) and analysed by IB using the indicated anti-bodies. Blue triangles indicate the unmodified E3, red triangles and lines E3-Ub(n) conjugates. The 6 control plasmids listed below are included in both Kit #1000000144: UbiGate Components (set1) and Kit #1000000145: UbiGate E2 activity screen (set2). Protocols available in original publication listed below.